Riot’s taken one measure after another to try and “clean up” the often-toxic League of Legends crowd. When all else fails, it seems, bribe ’em. 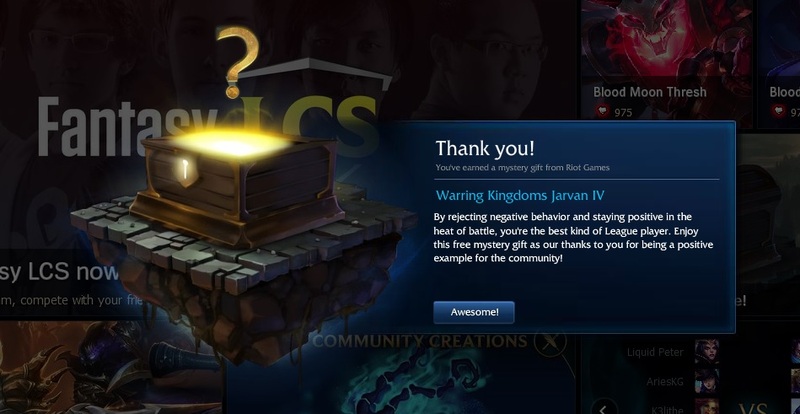 Summoners who are at least level five and had a clean record in 2014 — defined as never having a chat restriction or being banned — can now log in to claim their free gift. Even if you’re like me and played only a couple of matches in 2014 — which makes it hard for you to misbehave — you’ll receive the post-Christmas present: in my case, a skin for Jarvan IV. I might argue that for it to really take hold, it needs to be implemented a little more regularly. Players who see this and think, “Gee, I wish I’d been nicer” will probably forget about it come the later part of the year when that noob on their team makes them unleash a string of obscenities. But in any case, it’s nice to see Riot implementing some positive reinforcement to clean up their community. I shared my gift… what did you get? Highlander tryn 😮 wasnt he a legendary? Super Galaxy Rumble, yay! Thank you Riot. The community and “competitive” scene is getting more disgusting day by day in the last 1-2 year(s). When they weren’t so hyped, they gifted RP for xmas for every1, not some random skin that u prolly wont use even once. I’ve played some games yesterday ( haven’t played for about 5 months ). The community is the same, maybe even worse. But, thanks Riot for the skin ! I logged on my main and got Noxian Poppy. I logged on my sub and got Noxian Poppy. I logged on my EUW and got… you guessed it, NOXIAN POPPY. Wonder what were the odds, LOL! Careful now..comments like that are going to get you thumbs down’d. The truth is often painful..especially for what is widely considered to be the most toxic community on the net. To everyone else : This is not debatable at this point. It’s been said so many times..just a quick google of “league of legends toxic community” speaks volumes for this.. In my personal experiences i had much less enjoyable times with the DotA2 community (trolling especially – players throwing you into the enemy team and stuff like that), Orcs Must Die! Unchained (*flamming – in only a few matches i have quit after 3/4 players were flamming at me or each other) and most FPS games (cheating – duh). After 4 years or more of LoL, time in which i have never been banned or chat banned with thousands of matches played i will always debate the toxicity. It is highly exaggerated everywhere. Depending on the mode you play, ranked being more competitive with a higher toxicity (and probably 1-2 toxic players each match), while the further you go from competitiveness you get less and less toxicity up to a point where i find 1-2 toxic players in 3 matches of aram (that means from 30 players in total). And if you are wondering no i am not playing aram to run away from toxicity. I play it because i like it and i was playing aram in custom almost since it appeared, long before they made it a game mode. P.S. *i have only played a few matches of Orcs Must Die! Unchained and i kinda feel i do exactly what you do to LoL and judge the entire community based on a few players, in alpha or beta, in only a handful of matches, so i might rethink my displeasure towards it or give it another try to be sure about it. You seem to be under the impression that I am exaggerating..have you seen the amount of results google turns up regarding this? This is not a misconception–LoL’s community is literally viewed as being the most toxic on the net. Seriously, go look. Search it up. I am not joking. Heartseeker Vayne, early valentines present. Too bad I can’t play Vayne. I got an Infernal Nasus skin(legendary), I call that a win. I got the ninja rammus. I only play rammus when i get him in aram and i already have chrome rammus that i like more, but still Thank You Riot! I obtained the TPA Mundo skin! What a nice bribe, I must say! Luckily now the only thing I do is just log in to try to get first win of the day bonus then I stop. I must confess i do the same now. I still have 3-4 days/month where i am in the mod for some LoL and i play for a few hours, but for the last few months i mostly just do my first win and log out.